External ocular shields – Oculo-Plastik, Inc. Which one to choose ? All have good points to consider. 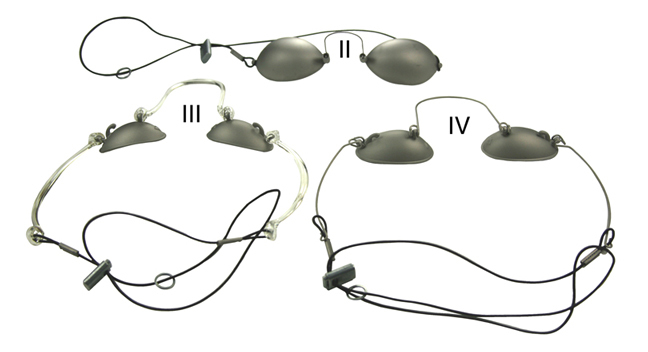 The Durette II is simple to install, but nasal pieces are not movable. Elastic needs to be moves up or down and may get fired on by the laser beam. One replacement elastic is provided and extra spares are available. If you do not work that close to the eyes, this is best choice. The Durette III have smaller shields and allows moving the plastic nasal and temporals up and down to clear treated area. Plastic attachments are sturdy so the whole unit hold well while installing on patients. Even though plastic attachments may need to be replaced after some months (years) of use, they are preferred by many users. Shields have thick edges for added comfort. Plastic attachments need to be washed with soap and water, they are not autoclavable. Shields in metal can be washed with alcohol. The Durette IV allows cleaning the whole unit with alcohol. The wires are stable, but the nasal wire piece can open up if handled carelessly. We recommend operators installs these to the patients. The unit is more demanding when installation is done on the patient, but many prefer the capacity to autoclave the unit and the all-metal design. So which one will it be? We have advocates of all our Durette external ocular shields.